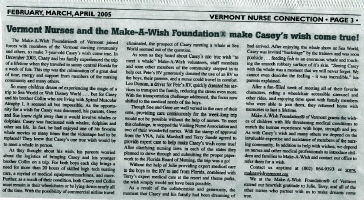 Vermont Nurses and the Make-A-Wish Foundation Make Casey's Wish Come True! He loves to listen to the Backstreet Boys, watch Teletubbies and Rugrats and his favorite movie is Free Willy. And just like all three year olds, Casey O'Neill loves to snuggle and be the center of attention. But, unlike other three year olds, Casey can't get up and dance to the Backstreet Boys or hop around the room when Teletubbies is on. When he was four months old, Casey was diagnosed with Spinal Muscular Atrophy Type 1 (SMA), the number one genetic killer of children under the age of two. SMA, also called Werdnig-Hoffman Disease, is a group of inherited and sometimes fatal diseases that destroy the nerves controlling voluntary movement such as crawling, walking, head and neck control, and swallowing. Casey has movement in his fingers and toes and he can communicate by blinking his eyes and making noises. Mentally, he is at or above his age level and he enjoys playing with Play-Doh, blocks and his race track with the help of his family and caregivers. He also uses an infra-red device, which connects to some of his toys, and can be controlled with his fingers to make a toy work. 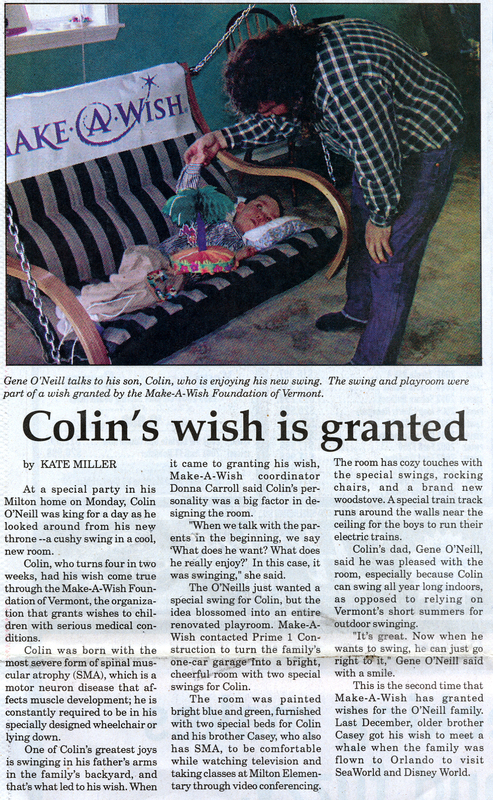 Casey is the only child in Vermont with SMA Type I, the most severe form of the disease. Most children with SMA Type I do not live beyond the age of two, but Casey celebrated his third birthday on January 23 with an open house celebration. Casey has a wheelchair and a tracheostomy, a surgically created opening from his neck into his windpipe where a tube has been placed to provide an airway and allow removal of lung secretions. He also uses a ventilator for respiratory support and a feeding tube for nutrition. His parents, Sue and Gene O'Neill, have learned how to use Casey's special equipment, and they are aided by daily nursing care from the Visiting Nurse Association, as well as many other special services. Through it all, "Casey is very easy going and very patient", says Sue. "Casey has brought our family closer and we've made lots of new friends". Sue and Gene also find support from the non-profit group, Families of Spinal Muscular Atrophy (FSMA), which they joined after Casey was diagnosed. FSMA is an all volunteer group that promotes and supports research and helps families affected by SMA. Through FSMA, the couple has found many resources for doctors, special equipment, and up to date research. In January of this year, FSMA announced that researchers have made a critical breakthrough in the understanding of SMA, a development which may lead to a cure. This exciting news gives Casey and his family even more hope for the future. As Casey grows, so does the challenge to meet his needs. To help, friends and family have created the "Friends of Casey Foundation", an organization which is dedicated to raising funds to provide Casey with therapeutic equipment and handicap accessible needs. On April 9, 2000, there will be a benefit to raise money for these needs. The group will also donate fifty percent of the proceeds to FSMA to help with public awareness and research. The benefit, sponsored by Jake's Original Bar & Grill in South Burlington and "Friends of Casey", will feature dinner at Jake's from 4:30 p.m. to 6 p.m. followed by live music, from Jenni & The Junketeers, and door prizes from 6-8 p.m. The evening will end with Calcutta from 8-9 p.m.
Sue and Gene are both hoping to attend the benefit and would like to bring Casey for a while. "I never ever imagined my life to be this way, but I wouldn't change it", says the proud mother. "Casey has such a great personality and sense of humor and he's just so fun to be around." "We just keep thinking about helping him and hoping for his future." Wherever Casey O'Neill goes, along with him goes his specially-designed wheel chair, his ventilator and the suction device he needs to cope with his Spinal Muscular Atrophy. The three year old takes nothing for granted. Every breath is a blessing, every experience a gift. Tuesday night was a restless one. His mom said he didn't sleep a wink. Wednesday, he was going to the Welden Theatre to see a movie. His first. Casey was one of a 100 local children with special needs, the types of children who might not be comfortable in public setting such as movie theatres. Their wants are the same as any other child's, but realizing their hopes doesn't happen that often. It's the story that always plucks the heart strings. It's the story that often lies hidden behind the lines that families with special needs children draw for themselves, or others draw for them. But there they sat. All 100 of them. Popcorn pressed to their hungry little chests. Eager eyes fixed on Robin Williams and the movie "Bicentennial Man". It's hard to imagine the excitement they must have felt. That's something Mary Schumer of the Welden Theatre understands. It's also what Mousetrap Pediatrics understands. And it's what motivates groups such as Whatever It Takes to do whatever it takes to bring some joy to these childrens' lives. Whatever It Takes is a joint program with Mousetrap Pediatrics and the University of Vermont. Its purpose is to develop programs to help families and children with special needs. Going to the movies was only one of many efforts. In this age of excess, we give attention to Bill Gates when he donates a billion dollars to MIT to study how the brain works. We give attention to Ted Turner when he donates a billion to the United Nations. We give attention to Hollywood when its stars set aside several hours for an AIDS benefit. Sending kids to the movies in St. Albans? Not a big thing. It's bigger than anything Bill Gates ever thought about. It comes from the heart. It comes from one person who looks directly into the eyes of another. Ask Fred Holmes who gently shook the hand of a small young man at the Welden who just wanted to say thank you. There's just not enough of that. Protest if you must, but it's become too easy to give money, and eas8ier still to beg off by saying there's not enough time to get involved. That's what's been happening to the Caseys of the world. Mary Schumer, of the Welden Theatre, said it right. St. Albans is a small town..."we can do this here." It's important that we do more. It's important that we learn from the Caseys of the world and to take each breath as a blessing and each experience as a gift. St. Albans-For a child like three-year-old Casey O'Neill, of Milton, who suffers from Spinal Muscular Atrophy, the simple treat of going to the movies is problematic. Casey's condition requires a number of care givers when he travels, in addition to a ventilator and other medical equipment. "We come with quite an entourage to care for Casey" said his mother Sue O'Neill. "Plus, with the noise of Casey's ventilator and suction equipment and all the moving around that would be necessary, we would probably be interfering with others enjoying the movie." Still, like any young child, going to the movies would be a thrill. Situations like this are just some of the obstacles which confront children with special health needs and their families. The "Whatever It Takes" initiative between Mousetrap Pediatrics and the University of Vermont is working to help families overcome those obstacles through efforts as complicated as interagency care coordination to things as seemingly simple as going to the movies. As a midwinter treat for children like Casey and their families, "Whatever It Takes" and the Welden Theatre in St. Albans are hosting a special matinee on Wednesday at 3 p.m.
Mary Schumer, the owner of the Welden, is donating tickets for any child with special health needs and one caregiver. Other friends and family members are welcome to attend and will be sponsored by Mousetrap Pediatrics and the Welden Theatre. The idea for the trip to the movies came from Jo Berry, a UVM Social Work student involved in Whatever It Takes. "She has been working with Casey and our family and going to his various appointments and one of the nurses mentioned how she thought Casey would love to go to the movies some day. Berry picked up on it and brought the idea of a special day at the movies back to her advisors," said Mrs. O'Neill. "It will be nice to take Casey to the movies and not feel really conspicuous doing it." Whatever It Takes is a unique collaborative learning initiative between Mousetrap Pediatrics, the UVM Department of Social Work, the UVM College of Nursing, the Department of Pediatrics at the UVM College of Medicine, and the Champlain Valley Area Health Education Center. Through this program, UVM graduate and undergraduate students work directly with families of children with special health needs in Franklin County to help them overcome the obstacles they face. "It's all intended to look at the manner in which children with special needs either do or do not get care by working intensely with the families," said Fred Holmes, M.D. of Mousetrap Pediatrics in St. Albans. "To help, you need to spend time with the family and really begin to understand some of the root problems which they face." The "Whatever It Takes" faculty includes Dr. Holmes, Mary Skidmore Taylor, MSW, of the Department of Social Work, Kathy Marn, R.P.T., the Rehabilitation Manager at Franklin County Home Health Agency; and Tracey Wagner, R.N., the parent consultant for Whatever It Takes. 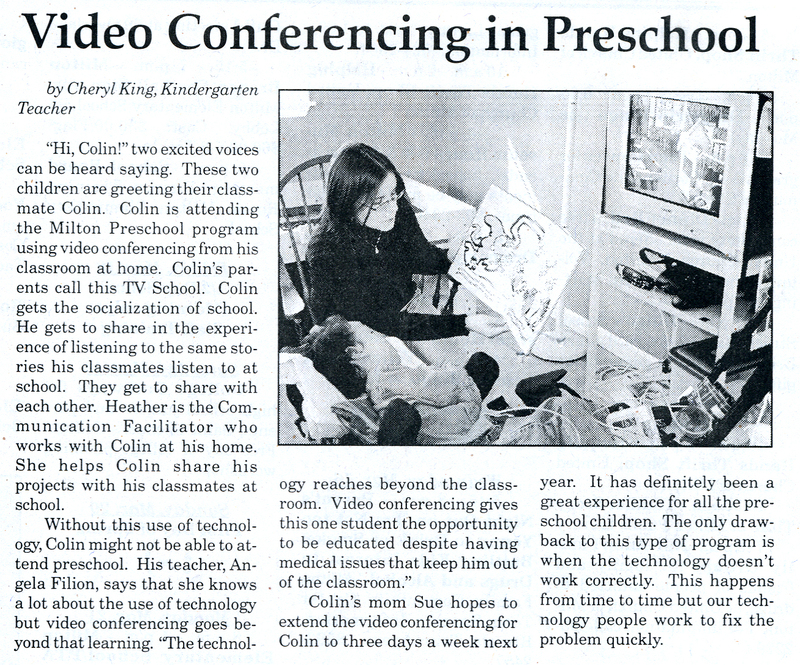 The program was initiated with funds from the Vermont Department of Health and the American Academy of Pediatrics. 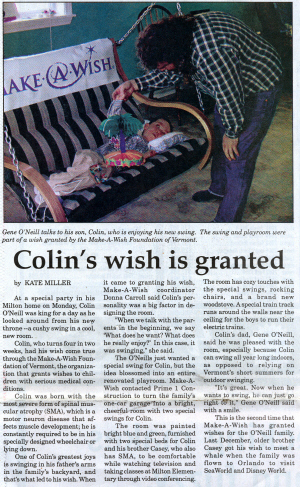 It is currently funded by donations from Mousetrap Pediatrics and the Vermont Department of Health, Division of Children with Special Health Needs. St. Albans--In 10 years, Casey O'Neill might remember the day he saw his first movie on the silver screen-Wednesday, Feb. 9, 2000. When the lights dimmed for the start of "Bicentennial Man", starring Robin Williams, Casey, a three-year-old from Milton, was not alone. It was a full house including some 100 children who, when plans for catching a movie are cooked up, often have to stay home. Things were different Wednesday, thanks to a bevy of caring organizations and individuals that united to pull off a memorable day for local children with special needs. Whatever It Takes, a joint initiative involving Mousetrap Pediatrics and the University of Vermont (UVM), was developed to assist families and children with special health problems. Its partner on Wednesday was the Welden Theatre which opened its doors for the event. And the kids were kids. They scampered back and forth down the halls before the movie began, the parents trying to keep them in tow. When the moms and dads stepped in line for popcorn, candy, and soft drinks, the kids flocked to them, giving up their chance to run free. Sam Peterson, of the giant drug company Pfizer, had arranged to donate the refreshments for the afternoon. After making their way through the snack line, the tail of which seemed to have no end, the children trundled back to their seats, oversized bags of popcorn pressed against their chests. In the doorway to the screening room, a small boy prodded by his slightly older brother, walked sheepishly up to Dr. Fred Holmes, an organizer of the event. "Thank you", the boy said. 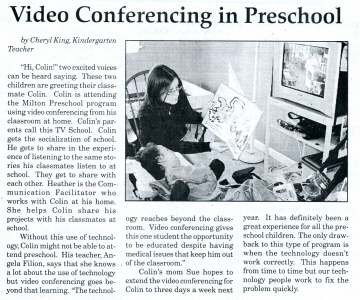 Dr. Holmes bent down and shook the child's hand. "You're very welcome", he replied. "The system is so complicated," Holmes said, standing back and watching the kids bounce past. He praised the work of the university, the network of organizations and individuals who work with special needs children to simplify things. "They work so intensively", he said. When the movie began, children tittered and whispered to the kids next to them and to the adults who leaned in to hear them. Jo Berry, a senior social work major at UVM, first brought the idea of going to the movies to her departmental advisor, Mary Taylor. Berry had been working with Casey O'Neill and his family. The boy suffers from Spinal Muscular Atrophy and a ventilator and suction device that he requires must be taken with him wherever he travels. The boy's wheelchair is long and Casey rests in it in a near prostrate position. According to Berry, because of the electronic fluttering sound the instruments make, the family has been hesitant to take Casey to the movies for fear of distracting others. It was one of the nurses who attends to Casey, however, who told Berry he would love to go to the movies. Sue O'Neill, Casey's mother, said that she and her husband, Gene, had planned to take their son to the drive-in last summer. The plan never came to fruition, so Casey's chance to see a movie on the big screen was put on hold, until yesterday. According to his mother, Casey knew what was on tap the evening before and could hardly wait. "He didn't sleep last night because I think he recognized it", she said, in reference to his first movie-going experience. Berry had contacted Dr. Fred Holmes of Mousetrap Pediatrics in St. Albans who suggested she get in touch with Mary Schumer, the owner of the Welden Theatre. Schumer said she frequently plays host for special screenings for educational and benefit purposes, and agreed to the idea. She even donated a pair of tickets for each child and his or her caregiver. Mousetrap Pediatrics picked up the tab for the remaining friends and family who were welcome to tag along. As the projector rolled and Robin Williams mechanically moved about in the role of an android, all went quiet. Schumer was behind the counter with her son. She robbed his black toss of hair, firmly and loving, as mothers do. She looked down the hall back to where the children were. "It's a small town," she said. "We can do this here".